Intel’s newest solid state drive, the PCIe-based QLC Intel® SSD D5-P4326, is about the size of an old-fashioned 12-inch ruler, and can store 32 terabytes. That’s equivalent to triple the entire printed collection of the U.S. Library of Congress. The new SSD is Intel’s densest drive ever, and is built on Intel® 3D NAND technology, which stacks memory cells atop each other in multiple extremely thin layers, instead of just one. Memory cells in the D5-P4326 are stacked 64 layers deep. Older disk drives produce a great deal of heat. In most data centers today, the single biggest cost is air conditioning to keep them cool. This is one of the reasons some of the world’s biggest data companies are planning to use the new “ruler” SSD to support their cloud and data center operations. In data centers, the no-moving-parts ruler-shaped SSDs can be lined up 32 side-by-side, to hold up to a petabyte in a single server slot. 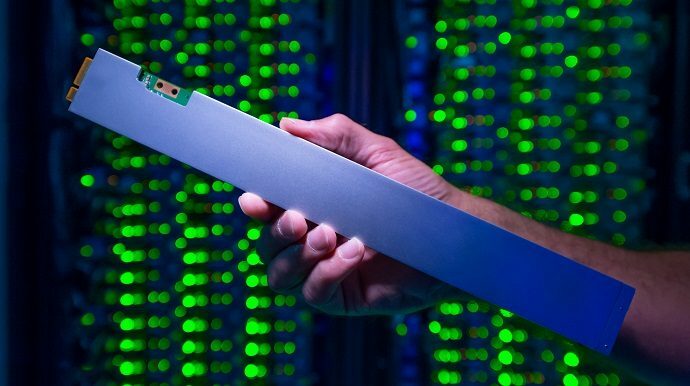 Compared with a traditional SSD, the “ruler” requires half the airflow to keep cool. And compared with hard disk storage, the new QLC 3D NAND SSD sips one-tenth the power (when it is part of a 1PB solution) and requires just one-twentieth the space.